Our decorators are equipped with the tools to ensure that your paint is smoothly and evenly distributed on all surfaces. Wallpaper can make a big impact on your room depending on the colour and the design. We pride ourselves in having a fully qualified and experienced tiler to complete your tiling requirements. We can supply and install perimeter edging you choose and finish it to enhance your new colour scheme. 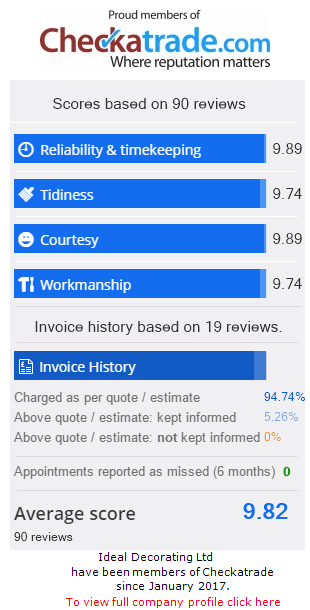 Ideal decorating Ltd is an established company with a reputation for reliability and quality of workmanship and will promise to deliver the highest standards to homes and businesses in Hertfordshire, Essex and London. Based in Sawbridgeworth and with over 12 years’ experience our professional decorating team are proud to offer a quality painting, decorating or tiling service for both domestic and commercial projects. The Ideal Decorating team’s standard of work is way above any other painter/decorators we have used. We were more than satisfied with all the work they have done redecorating our whole house and we were impressed by their attention to detail. They were also very polite and friendly and absolutely no bother to have around the house. All jobs were completed in the anticipated time and budget. Would recommend to anyone! Being a Landlord, I had a vacant property to be refurbished (painting and decorating of each room). The Ideal Decorating team got to work in the short time frame requested and delivered very good work: very professional, reliable, meticulous, the job finished in time and as promised to a high standard. I would highly recommend Ideal Decorating Ltd. I rang a number of painter/decorators before I found Ideal Decorating Ltd. I was delighted, as they offered me the very best quote to decorate my whole house. I'm thrilled with the result and also the methodical and tidy workmanship. I'll certainly be using Ideal Decorating services again. Great job all round!! We used Ideal Decorating to wallpaper a feature wall in the front room and bedroom of our house and we found the work to be of a very high standard, the cost of the work was acceptable and the quote given did not change when the work was completed, I was very satisfied with his work and would definitely use him again. I have just had my bathroom splash backs re-tiled and all walls and ceiling re painted by Ideal Decorating and the final results are excellent. The service from the first meet to final completion was very professional and honest. Their work is of a very high standard and the attention to detail, craftsmanship and cleanliness is exemplary. Highly recommended. A business reputation built on trust. The quality of our work and our experience guarantees beautiful, lasting results, from exterior coating to fine interior finishes. We provide painting, decorating and tiling services with the highest level of customer satisfaction. We will do everything we can to meet your expectations with a variety of offerings to choose from, whether interior or exterior. With a keen eye for detail and only using quality materials - our clients can expect a truly professional finish.